Venture into the Unknown! A complete tour through the development and production of the Emmy-winning animated miniseries Over the Garden Wall, this volume contains hundreds of pieces of concept art and sketches, and a comprehensive look at the show’s breathtaking production art. From the original Tome of the Unknown: Harvest Melody pilot, through each of the episodes, and beyond, take a strange and wonderful journey with Wirt, Greg, and Beatrice. Learn how the award-winning backgrounds were created, see animation storyboards, and even take a behind-the-scenes look at the production of the Mondo vinyl soundtrack and “For Sara” mix tape, as well as the ongoing Boom! Studios comics. Sean Edgar guides the tour, which includes commentary from creators Patrick McHale and Nick Cross. Well-known as the creative director and writer on Cartoon Network's Adventure Time series, McHale is an artist/writer/cartoonist and the creator of the Over the Garden Wall mini-series. 5.0 out of 5 starsA wonderful book! What a wonderful book! It is visually gorgeous and chock full of sketches, drawings, background & production art, and much more. Just turning the pages is a delightful experience, and put me into the captivating mood of the show. I expected there to be a lot of amazing artwork in the book – and there is. In addition, the physical book itself is stunning, with many lovely small touches such as the intriguing endpapers (and of course, so much of what in between those endpapers is awe-inspiring). However I was surprised, and especially pleased, to find there was far more to read about how Over the Garden Wall came to be than I had hoped for. The book is beautifully organized into chapters detailing all that went into making OTGW, as well as its pilot Tome of the Unknown. It was fascinating to read the remarkable behind-the-scenes story of the entire creative process – in the words of creator Patrick McHale, as well as many others who worked on the show -- how the original idea was first conceived, and learn about all the steps it took to see it through to its completion. 5.0 out of 5 stars"All that was lost is revealed"
Over the Garden Wall is classic Americana in an age where classic Americana just doesn't exist anymore. It leaves you feeling a deep sense of nostalgia for a time you have never lived through or experienced (a recently coined word, Anemoia, has been made for this feeling). It is magical, whimsical, thought provoking, dark. It's like an conglomeration of everything you loved from your childhood, and things you enjoy as an adult. Best of all (in my opinion, but I am an art major, so perhaps I'm biased in this regard), it has some of the best design and art direction of any animated series to come out of the 21st century. 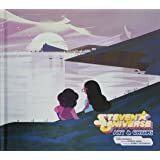 This book is a wonderful assortment of backgrounds, character sheets, and words from the creators of the show describing how it all came to be. And it's just as beautiful as any one of the episodes. I was particularly interested in how this show came about, so this book was a marvelous addition to my library. I have already spent time getting "lost" learning about Patrick Mchale's vision for the story and how it evolved over time, as well as learning some tidbits and insights into the world of The Unknown. 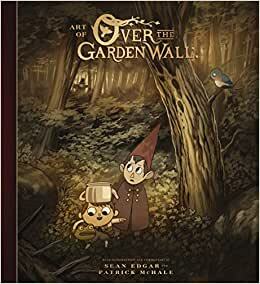 This book is an absolute must-have for any fan of Over the Garden Wall or television animation in general. And if you haven't watched the series yet, you had better get on it, because you are most definitely missing out. I'm nuts for art books, especially Dark Horse Published art books as they always impress me with their quality. I pop my OtGW DVD in every October. It's become a tradition since it first aired in 2014 and serves as a much-needed pick-me-up, without fail, helping me to cope with the season change through sheer inspiration. The book, itself, arrived promptly, in perfect, undamaged condition and I sat there for an hour marveling at the creators notes, drafts and lovely pictures. The printing is quality, revealing brilliant colors against deep, rich black. The binding was nice and sturdy, perfectly aligned. If you are a fan of this awesome little miniseries, GET IT. It's a great price for the high quality and will feed that craving for new and interesting information about the production process. I was completely unaware of this series until I found this book. Now for the first time since Courage the Cowardly Dog I want to watch a CN series. The quality is fantastic and full of details, especially regarding character and background design. Complementing the wonderful artwork are the author's commentaries regarding their design choices which provides a great insight into the love and care that was put into the series making. There's also an episode by episode commentary which admittedly I haven't read simply because now I want to watch the series. I came upon this book by chance and it's delightfully atmospheric cover immediately caught my eye. I've always been a fan of fairy tales, especially the mysterious, creepy kind which give both a sense of wonder and dread, and was delighted when the book preview confirmed that that was indeed the overall theme of the book. It was unintentional, but now that I look at the date I realise this would be a great Halloween gift, so wether you're an artist looking for inspiration and knowledge in great artwork, or a fan of the series looking for more insight and interesting tidbits, or simply someone who loves the eeriness and excitement of wondering what's beyond the wall, then give this book (and the series) a chance. This story changed my life. In many ways my life echoes that of Wirt and Greg. I was depressed at first but just like Wirt, I came out far stronger,having taken my own journey over my personal "Garden Wall" afterwards. The book is a fascinating journey into the story's creation with so many rough sketches, concept art, backgrounds, character design and their personality development. As well as Patrick McHale's personal account into how his masterpiece was created. Thank you Mr. McHale for creating such a meaningful story and certainly the classiest program ever to air on Cartoon Network.